From September 1st 2015 I am going to carve out at least 30 – 60 minutes each day to ‘make something’. I will do this for a whole year. To help me get on my way, I will choose a theme each month. 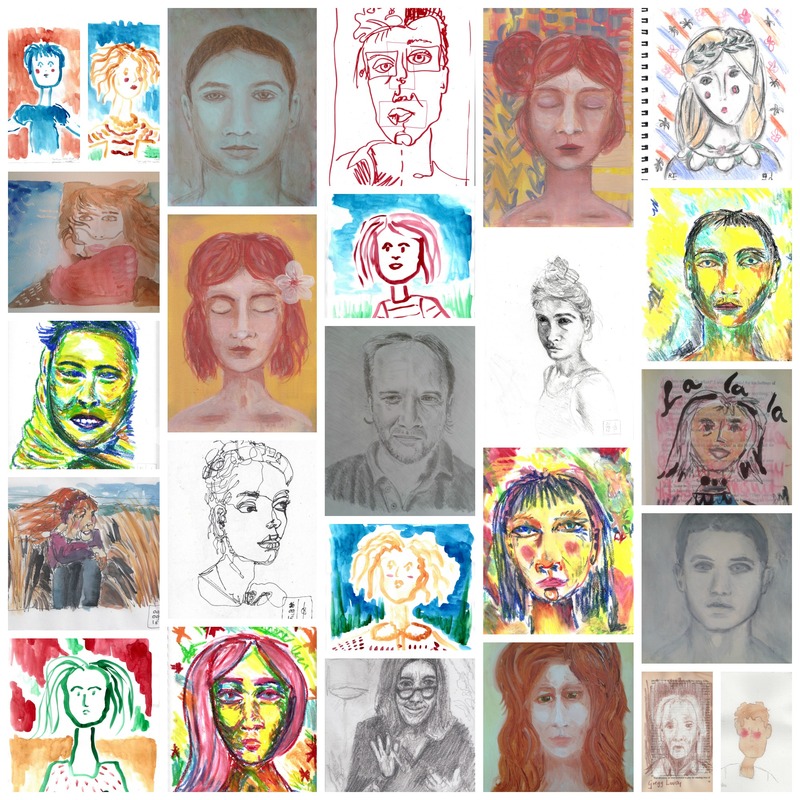 The theme for September is: Faces. I am totally excited and looking forward to a great adventure. I took the 101 art challenge last year and the 101 Bird challenge in 2014. Both implied making some kind of art work for 101 days in a row. It was fun. And I learned a lot from that. I know I will learn a great deal more by doing daily art during a full year. This is a page about that year – about the results and the process. It will grow from month to month. I will post a choice of pieces on this page at least once a month. For now, just a collage of faces I did just before the start of MY YEAR OF DAILY CREATING. I had a postcard made out of a collage of September FACES. Want to support my Year of Daily Art? Please buy your collage card from my Etsy shop. September faces collage. Also turned into a postcard. MAKE MY DAY! BE AMONG THE FIRST TO SUPPORT ME: For the first set of 10 cards it comes at a very low price – which will cover cost of print and shipping, but no more. I will send you one with a personal hand written message. Please come and find it in my Etsy shop! My Facebook page. Also called Corinnemaakt. Do check it out! I will share some of my best results to my Pinterest account from time to time. Some of the results from October 2015. Watercolor in Strathmore 300 grams paper. OCTOBER was more free. I did pick a new theme, flowers and flying critters. But I really liked the idea to be able to do some more faces. or finish pieces from before. Also I knew I was going to be in Cat Bennetts Sketchbook class – so I would be doing a lot of sketching, mark making and drawing – and sharing – sketchbook pages. I did feel a simple drawing wasn’t enough – it was like perfectionism was suddenly back urging me to do both sketching and other work. I made several watercolor paintings of flowers, some drawings of household items (from the sketchbooks) and drawings of sunflowers and dragonflies. Those are the best results of the month in my eyes (you may disagree of course!). There are many many pages of mark making and pattern from the sketchbook class (I loved doing that). More on October results and more process notes can be read on the summary page for the month of October. 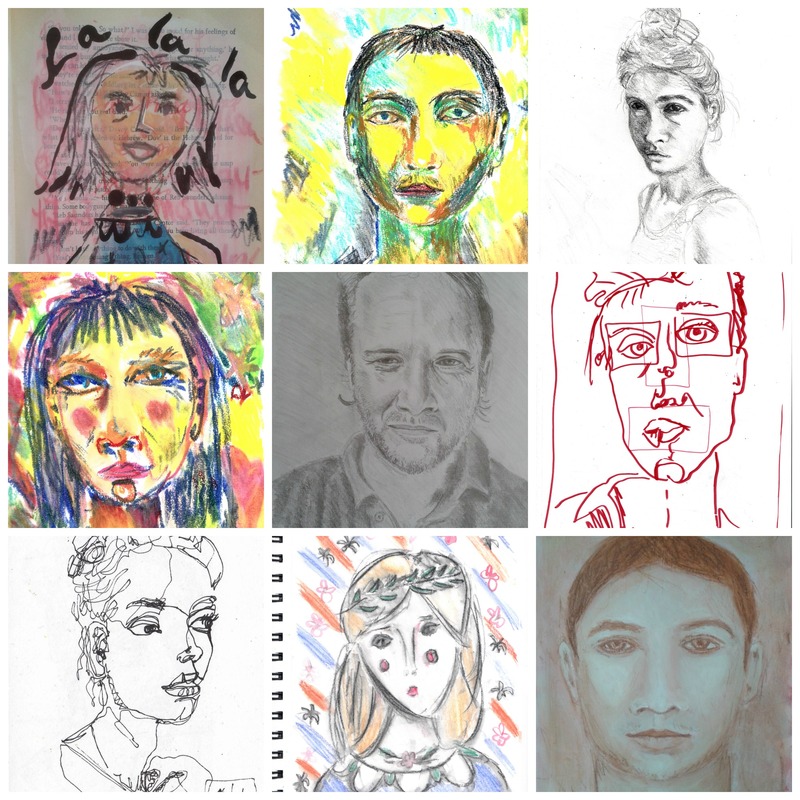 NOVEMBER 2015 was about drawing and sketchbooks. I joined Cat Bennetts Sketchbook class, hosted by Carla Sonheim. Given work duties and private projects, I decided to be gentle on what I ask myself as part of the daily routine: I made sure I did the 30 minutes daily, but didnot push for daily results (as in: finished pieces each day) in November. Nor did I post every day. This was a fruitful month. I learned wonderful things from Cat Bennett. I learned about keeping loose, trying new ways of mark making, working without a detailed plan beforehand, letting go of perfectionism. I added new routines to my drawing and painting toolbox. I also learned that one can be over-committed. For instance, I joined a challenge for doing daily art journaling, was inspired for a while, but had to decide to quit before the end, because it didn’t fit my plan well enough. Meanwhile I was on a live oil painting class and was doing work for Year of the Spark. Enough input to keep going. I got sidetracked halfway by two things, getting ill and making only small steps towards art (background random marks on pages, to add to later). Halfway the month when I hoped to give an update, I stopped as I heard about the Paris attacks and decided to delay my post. Getting ill has been a returning thing – so this has had me wondering (later on) whether I am taking on too much. I didn’t make a collage for the month. In DECEMBER 2015 the theme was: “Dark and Light”. I thought it would be fitting, considering the darkest period of the year, the longing for the returning light. Wow, that was hard. I worked in mostly black and white, in a very muted palette. This was interesting sometimes. I was reminded that a tiny spot of color in a piece in grey tones looks really good, gets the attention of the viewer. That was great. But my oh my, did I long for color and light after a few weeks. In that sense, I had a hard time with that theme. JANUARY 2016 was about the theme “Pigs and Horses” – which was meant to bring me into the field of stories and characters. 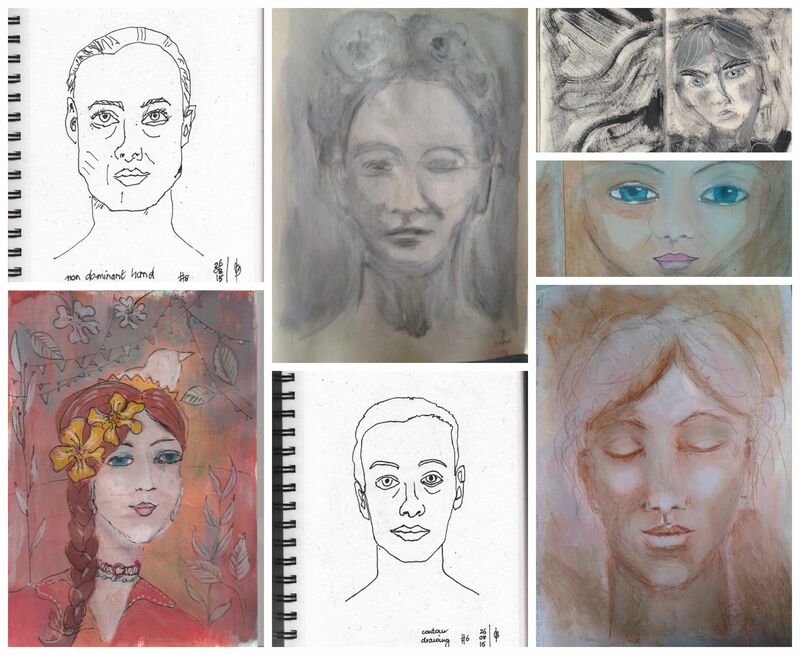 I joined the 30 paintings in 30 days challenge – and as a result painted a lot! Some paintings I chose from the months before. To see what I shared during the challenge, please check out the dedicated page for this challenge on this blog. This is actually not the same as the results for the month. But it’s close enough. I also checked out the work of some of the other people involved (over 1500 worldwide! ), which was inspiring too! Another cool result of that month had to do with the fact that I decided to work in a series, making pieces inspired by only one technique. Doing that led to wonderful results and a deepened understanding of the technique. I look upon that month as a very successful one as far as keeping a steady pace and keeping painting was concerned, even though it was harder sometimes given sick days and illness in my family. There were a few days I missed. I decided that it’s not a big deal: future extra work makes up for that. And I have made up for it. One of the results in January was painting more. I hope to do that again, but don’t feel the need to do it every day this month. (I do want to keep up the daily work rhythm, of course.) January was busy – it’s time to take a slower pace, to approach things differently. Painting a lot did feel good though. Working on several pieces for more than one day at any given time, worked well too. Given that I had several pieces going at the same day, after a few days I was still getting daily results. That said, for February – at least for the start – I’ve decided to do more drawing, to do some experimenting again and do quick paintings (30 minutes maximum). This change of approach will be refreshing. New classes I am taking will help with this too. Among them I mention: Carla Sonheims “Y is for Yellow”; “A Year of Painting” by Alena Hennessy, both going for the whole year. And…. for the theme of February especially helpful: “Wonderland” course (8 weeks) by Jane Davenport. The course focuses on using watercolor and the topic is: Alice in Wonderland. The theme for February will be “Magic and wonder”. By March 1st I will be halfway the year (yeah, happy dance!). I can’t say in advance how I will move on in March. I will probably change something to the blogging (content and frequency of posts). I’ve thought for a while that as this blog is linked to my personal Facebook page, this will probably be of interest to some of my followers, who will love it, but others might hate it. They might feel I am flooding their timeline with unwanted art. (What am I saying, who can think such a thing?). – I started a Facebook Page called Corinnemaakt for this reason. “Like” my Facebook page (and get notifications of my art that way).